By the end of the year, the Russian Navy will be receiving two state-of-the-art nuclear powered strategic submarines. Yury Dolgoruky is brand new, while Karelia has been modernized to improve its tactical and technical performance. Russia also plans to resume testing of the new Bulava ballistic missile this summer. The strategic nuclear Delta-IV class submarine K-18 Kareliya has started mooring trials after modernizations at the Zvezdochka shipyard in Severodvinsk, Arkhangelsk Oblast. The modernization has prolonged the submarine's lifetime with approximately ten years and improved its tactical and technical performance considerably. News paper Izvestia reports that sea trials will start this autumn and that the submarine will be handed over to the Northern Fleet at the end of the year. According to Wikipedia, Kareliya is one of seven Delta-IV class nuclear submarines built from 1985 to 1992. All are still in service in the Russian navy today. Five submarines have already gone through modernization at the Zvezdochka shipyard. 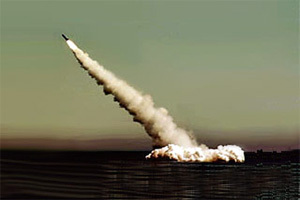 After the modernization the submarine's main weapon system is the Sineva ballistic missile. According to Wikipedia, it can carry ten 100kT warheads. In a test launch on 11 October 2008, an R-29RMU travelled 11,547 kilometers downrange. Governmental tests of the strategic nuclear submarine Yury Dolgoruky are planned to be conducted this autumn, and the submarine should be delivered to the Fleet at the end of the year, web site Severnyflot.ru reports. This is Russia's first submarine of the Borey-class, and the first to be equipped with Bulava missiles. Yury Dolgoruky has been built at the Sevmash shipyard in Severodvinsk. Two other Borey-class nuclear submarines, Alexander Nevsky and the Vladimir Monomakh, are currently under construction at the Sevmash plant. 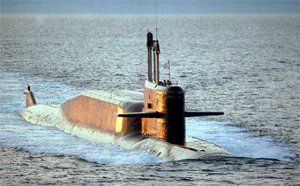 Construction of a fourth submarine of this class is planned to start up either in connection with the celebration of Navy's Day in the end of July, or in connection with the shipyard's 70 year anniversary in December 2009. The name of this submarine is yet unknown. Both the Pacific Fleet and the Northern Fleet will recieve submarines of the Borey-class. As BarentsObserver earlier reported, the three first vessels will probably be taken into service at the Pacific Fleet. Yury Dolgoruky will be Russia's first submarine to be equipped with Bulava missiles. It will have 16 missiles, each carrying up to 10 nuclear warheads and having a range of 8,000 kilometers. The next test launch of the Bulava sea-based intercontinental ballistic missile is planned to take place at the end of July, Head of the Russian Navy Vladimir Vysotsky said according to Vedomosti. There will be four or five test launches this year. Since 2003, Russia has conducted ten test launches of the Bulava missile. Five of the tests have ended in failure, like the last test on December 23rd last year, reported by BarentsObserver.